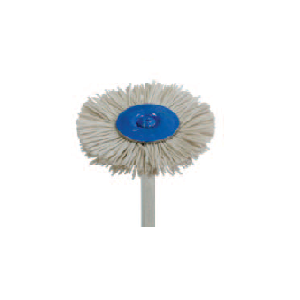 Polishing brush for composites – The fibres of the brushes are impregnated with abrasives. No polishing paste is therefore required. All dental technical restorations must be carefully finished and polished to a highlustre. High-lustre polish is surface refinement. Surfaces are polished from coarse to fine using the respective polishers. After polishing using polishers, high-lustre fine polishing is completed using brushes and mops with the use of polishing paste.